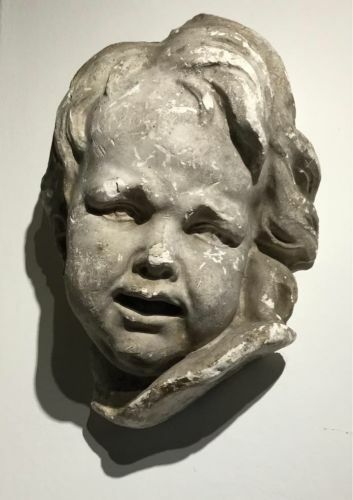 BRUCCIANI, D. &Co [1851-1923] Plaster cast of the head of a Putto [ a naked cherub or angel, especially from the Renaissance period] No date. Approx 41cm x 29 cm x 20 cm- a large and impressive plaster in wonderful aged condition. “D BRUCCIANI & CO LONDON No 50” stamped into the base of the plaster. Domenico Brucciani [1815 -1880] was born in Italy but travelled to England in the second quarter of the nineteenth century. His business made casts of sculptural works from the Renaissance period. In 1837 he is known to have been based in Covent Garden and selling works to the British Museum and what is now the Victoria and Albert Museum. In 1857 D. Brucciani & Co. were working for the British Museum, making casts to be sold commercially. The company was successful during this period, supporting the fashion for classical sculpture which many travellers had seen on their continental “Grand Tours”. After Brucciani ‘s death in 1880 the business was bought by Joseph Caproni [1846 - 1900] although the company kept the Brucciani name, and continued to make casts, until the fashion for them declined. Eventually the V&A bought the company, and used its moulds until it closed the plaster moulding department in 1951.This is a large and heavy piece- probably best collected from us at a book fair rather than posted.